An investigative report by the Human Rights Commission says there's strong evidence that employees of color at the Vermont Psychiatric Care Hospital in Berlin, seen here in this file photo, are being subjected to racial harassment by their co-workers. A new investigation paints a disturbing picture of workplace harassment at the Vermont Psychiatric Care Hospital in Berlin, where some African American staff members say they've been subjected to "offensive and racist comments" by co-workers. Editor's Note: This story includes documents containing offensive language. 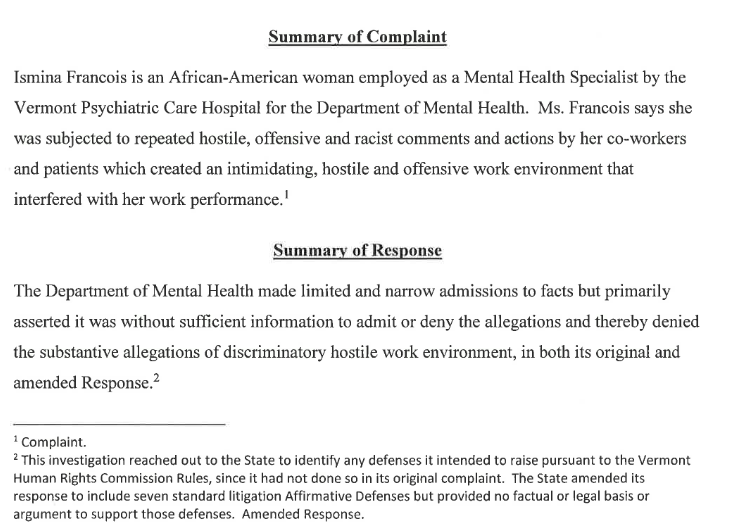 Ismina Francois, an African American woman who works as a mental health specialist at the state-run hospital in Berlin, alleges in a complaint to the Human Rights Commission that she was subjected to repeated racial harassment by co-workers. The investigation that followed has uncovered numerous alleged incidents of racial harassment against not only Francois but other workers of color. As one African American employee was leaving work in 2007, for instance, he walked to the parking lot - the state hospital was at that time located in Waterbury - and saw that a racial epithet had been scrawled on his windshield by a colleague. Co-workers, “for a lengthy period” of time, repeatedly called the same man “Chocolate Boy,” or “Little Bill,” in reference to Bill Cosby. Redactions made by VPR to remove the names of individuals in the report. The woman later admitted to using the phrase, and apologized. Citing those instances and others, the Vermont Human Rights Commission has concluded there are “reasonable grounds” that racial harassment is occurring at the hospital. Francois, a single mother of two children, says the harassment she’s endured from co-workers have created “an intimidating, hostile and offensive work environment that interfered with her work performance. From the use of the term “colored people” by one of her co-workers, to the time when somebody remarked that she must have been dropped off by the “welfare bus” when she arrived at work, Francois says the harassment has been pointed and persistent. Francois, through her attorney, declined an interview Monday. The investigation that spurred Francois’ complaint has uncovered allegations of racial harassment directed not only at her, but at other staff members of color at the state-run hospital in Berlin. Commissioner of Mental Health Melissa Bailey says that, because litigation is pending on the matter, she can’t comment on specific allegations. “We take this extremely seriously, and we are doing everything we can to protect staff,” Bailey says. 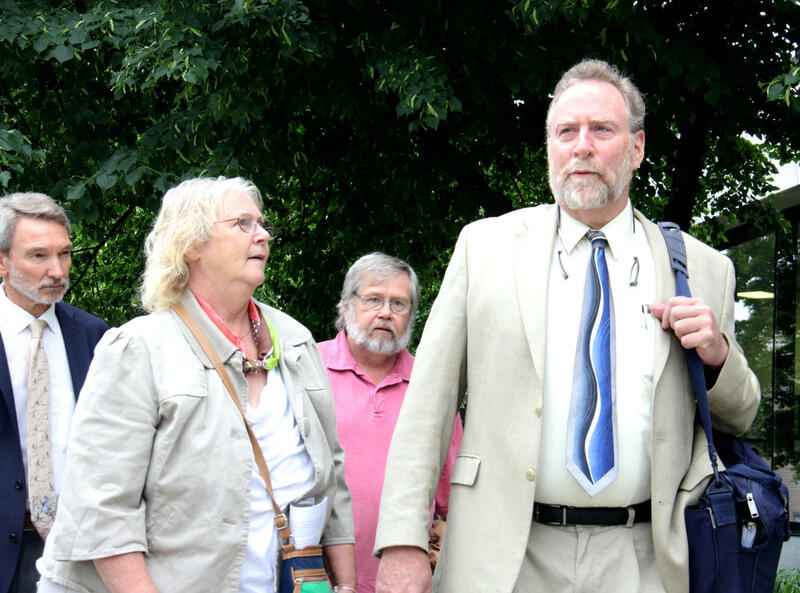 Attorney Robert Appel, right, says his client has endured years of racial harassment in her job at the Vermont Psychiatric Care Hospital. Bailey says some staff members have been already disciplined for violating the state’s workplace harassment policies — the man suspecting of writing the racial epithet on the African American man’s car has since been terminated. And Bailey says work is underway to address the underlying factors that may have given rise to the problem. “There’s a few bad actors, and the others are concerned that they want to step up and support their fellow co-workers," Bailey says. A staff-wide mandatory diversity training session in fall of 2016, according to Bailey, was one attempt to address concerns about workplace hostility. More recently, she says employees have come together to draft a civility and conduct policy. The hospital has been without an acting CEO of late, but Bailey says she’ll be appointing a new leader soon. She says she’s also brought in two people from her central office to oversee operations at the 25-bed inpatient psychiatric facility. According to the Human Rights Commission investigation, however, many staff members of color found the diversity workshop to be “useless.” And Appel says that his client hasn’t reported any substantive improvements at her job. The executive director of the Vermont Human Rights Commission wasn’t immediately available for comment on Monday. But Appel says the commission now has six months to decide whether to file a civil suit against the state for employment discrimination. Appel says he and his client are hoping to reach a settlement instead. Francois’ primary request, according to Appel, is to be reassigned to a different post in state government. “I take my hat off to [Francois] for being a strong young woman and saying, ‘I don’t deserve this,’” Appel says. “She’s had nothing but positive performance reviews. Why should [she] have to put up with this hospitality in order to make a living and feed [her] two kids?” Appel says. Appel, a former director of the Human Rights Commission, is now a private attorney who often represents clients of color dealing with workplace harassment. He says Francois’ story is not unique. During the month of February, Montpelier High School will fly a Black Lives Matter flag outside the school. A Milton mother says her daughter was suspended from school after another student addressed her daughter using a racial slur, and now organizers with Black Lives Matter are calling for Milton Superintendent Ann Bradshaw to resign. A Burlington man has been directing a barrage of racist emails to members of the Vermont Legislature.